No. Wrong word, Jonas thought. Frightened meant that deep, sickening feeling of something terrible about to happen. Frightened was the way he had felt a year ago when an unidentified aircraft had overflown the community twice. So. I kind of had high expectations for this one, because I watched the film first (the horror! ), and the film was amazing. The whole way it was delivered and the ideas behind it were beautiful! So naturally, I thought 'If the FILM was this good, then the book must be mind-blowing! Since books are always better than movies.' Unfortunately, this was one of those rare cases where the movie was actually kind of better than the book ^^ Even though there were minor things I wished they included. I didn't connect to the characters much. Maybe because they couldn't feel emotion (yes you heard me right), or maybe because it was in third PoV, but for some reason, I didn't emotionally feel them. Or make any kind of special bond. That was a bit disappointing. If the characters weren't up to par, then the plot must have made up for it, no? No. The plot was alright, with the exception that Lowry built the tension up and up and up and up.........and then..... wait what? I didn't get it! 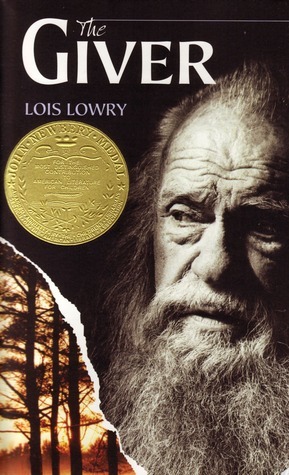 All that building between Jonas and the Giver, and then THAT'S how it ends? I was just left in my seat so confused. Of course, as I mentioned, I watched the film first, so I knew it was going to end like that. But what I thought was that books have more detail. It's deeper. You understand everything so much more clearly. It couldn't have ended that simply! It's just weird. Maybe I was supposed to analyse it or something... *shrugs* Maybe I will someday. I spent about half an hour reading up on other people's reviews, working out the ending for myself. Some people loved the ambiguity of it, some did not. I'm in the latter, but I understand the whole 'vague' sense the book also thought was necessary. After all, it's really hard to resolve books with a confusing plot aim. Sometimes, open ended endings are great, but other times, they fall flat. Instead of making you ponder your meaning on life, they confuse the heck out of you until you eventually lower the rating. This is a "perfect" world. From when you're born, the government has your life planned out for you. They stalk watch you until you're 12, and they decide on the perfect job for you based on your personality. You can apply for a spouse when you get older, and they'll give you a perfect match. You then apply for kids, and babies (up to 2) will be handed to you. When you get too old to work, you get sent into the House of the Old until it's your time of Release. They also can't see colour. I think that's the worst... colours are the most beautiful things <3 I would die! The book really makes you grateful for this world right now and that you're in it. Meh- Writing Style, Characters, Ending. Dad: Who wants to watch the Giver? Dad: we're going to watch the Giver! The visuals are done really well, and the casting is also great. I don't think there was enough character development in Jonas' family, but that's alright. At the end of the film my family was like "That was awesome!" But yeah, the movie was a liiiittle more amazing. :) I would really recommend you to see it if you haven't. It doesn't matter if you haven't read the book for this one, since there aren't any big plot twists or such hehe ;) If you have seen it, tell me what you thought! :D So curious. —MissOddball€ (Too lazy to swap keyboards for the TM) Over and Out.